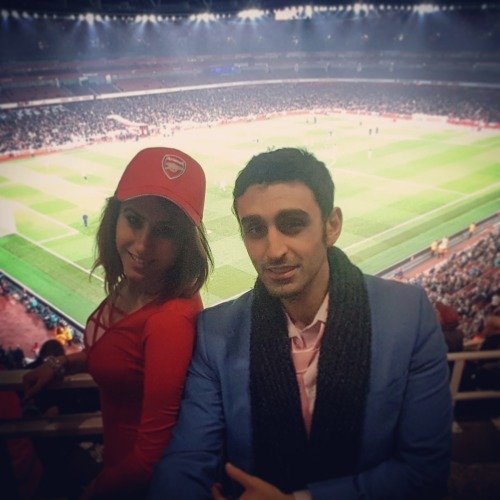 Our first football match together was to see Arsenal (big fans) Vs Reading (not so big fans! ), down at the Emirates Stadium in London! 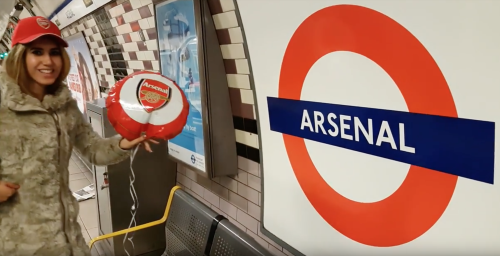 We met after work and made our way by tube to Arsenal Underground station. I didn’t actually realise there was a stop called this in London! But it makes sense seeing as there is a massive stadium there home to the football club. The were about 60,000 people all on their way to the match so you can imagine what the streets looked like! There was a lot of friendly rivalry between fans along the way, teasing each other, which made a pleasant change as you always hear about ‘Hooliganism’ surrounding matches. So we made it into the stadium after a very brief bag search only to find that our original allocated entrance was home to the away team and we were promptly sent away to the other side of the stadium!! We eventually made it round, but by this time kick-off had started and we could hear the crowds cheering in the stadium with the stragglers outside going through another round of security and bag checks. But we finally found our seats and they were perfect!! We sat in the upper tier in the front row and were surrounded by friendly fans who cheered with us. The game went on and it was great, 90minutes and Arsenal scored 2 goals, one for each half. Oxlade-Chamberlain was the man of the match scoring both goals. The unity in the fans was inspiring, there must have been about 50,000 Arsenal supporters cheering enthusiastically for their team. It was a jovial atmosphere and we all left with big smiles on our face. Even the Reading supporters were happy despite loosing! Perhaps the media portrays football matches in a negative connotation but our feeling was that everyone was unified and came to enjoy a good match of football. Check out our little video below for our highlights and coverage!! 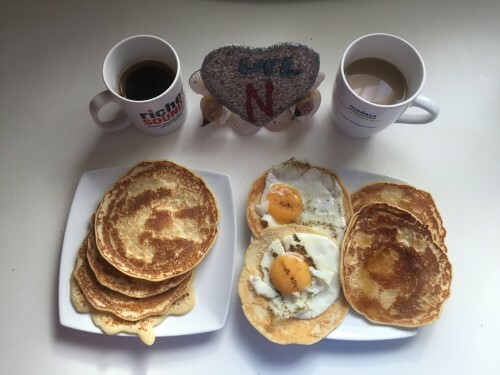 This morning we woke up with a pancake craving! Pancakes are simple and easy to make. With this most basic pancake recipe being 1:1:1. 1 Cup of plain flour, 1 egg (whisked) and 1 cup of milk. 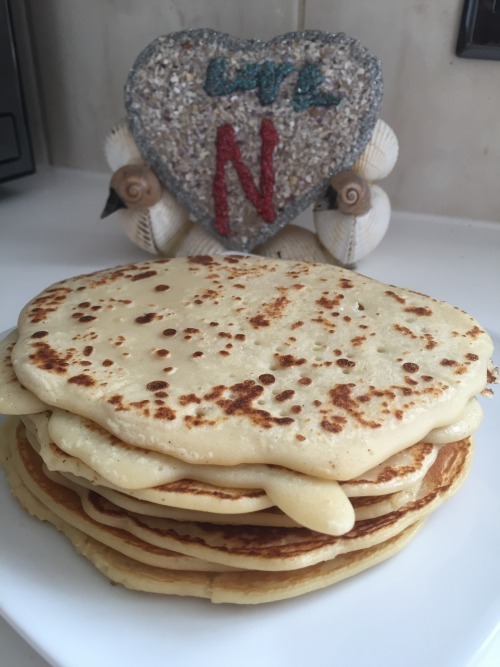 I’ve been making pancakes for as along as I can remember, they are just so quick, easy, versatile and filling. You can supplement any of the ingredients to suit your diet, eg bananas, protein shake or gluten free flour. Mmmm delicious freshly homemade pancake stack! I’ve gone for the smaller shape American Style pancakes, but you could make them thinner and larger for Crepes! Best served with a handsome young man! The finished product! My gorgeous husband chose to have eggs on his for that extra protein fix! Whereas I chose a sweeter pancake with maple syrup and freshly squeezed lemon juice! Served with fresh Turkish Coffee made in a traditional cezve. Delicious! Needless to say they were finished in about 5minutes! 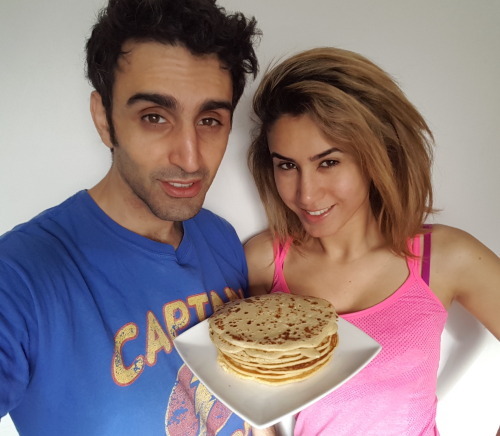 Go ahead and try making your own pancakes today and let us know how you got on in the comments below and if you’re feeling confident post a pic! !